This idea is use from the different geometrical models of the Bows (music) 1) substitute of current & exist Bow (music) in the market and or 2) plus with current bow that it use in String instruments (musical instruments stringed) as violin & violoncello. In this idea substitute of bow may be used from the plectrums that use in others String instruments as guitar. Picture attached to this patent have different geometrical models of the bows. 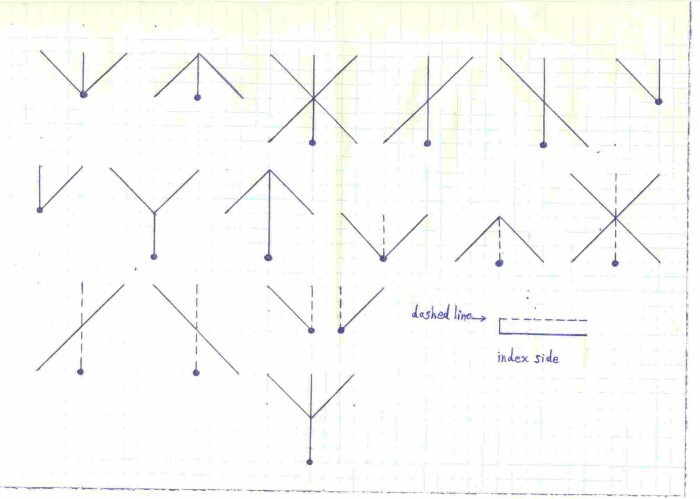 In the picture attached are the geometrical shapes that in those drawn dashed lines that dashed line in fact is current bow (the part of total of new bows) that current bow be seen in others geometrical shapes with this difference that in the shapes that have dashed lines , current bow made in the manner that don’t have no any connect with to the strings of violin (more info & as in index side in the one of shapes said) and so violinist by seeing of it will be remember that must be play with new bows like current method for playing violin with current bow as learned. In end of any one of shapes in the part of bow (music) that must be taken in hand of player for playing is marked by solid little circle. Must be use from new bows (music) by the group of musicians plus of other group of musicians that they use from the current & exist bow (music) in market. If the problem is in perception of shapes that are distinct by dashed lines please 1st attention on others shapes to be can perception of others shapes right and convincing real evaluation & scientific and economical justification of this patent. Page created at 2019-04-25 18:41:32, Patent Auction Time.